Have purchased before and the hose has lasted a very good time considering the use it gets . Always delivered quickly and efficiently as well . This is my second replacement hose in 2 years, it seems as though it only lasts for 1 year before it starts leaking. I needed a spare immediately and I got it immediately!!! I needed to renew a hose on my bidet shower. The replacement arrived promptly. The after sales service is good. I would recommend this company. if you ever travelled and enjoyed the hotel convenience of a proper plumbed in spray shower and got home to look disappointedly at your old plastic jug or metal lota..... you need this. Top quality, mixes warm and cold to your own choice of set temperature, and IF YOU FOLLOW INSTRUCTIONS TO USE ISOLATOR TAP and do NOT leave it on all the time, it will last long. Cheap price, arrives fast, quality stainless steel fitting, fantastic customer service. 100% recommend this. I am a regular customer of Bidet Showers and me and my friends always buy from Bidet Showers. Very pleased with the service and quality of the items as well as the speed of despatch. I'd have no hesitation in recommending this company. 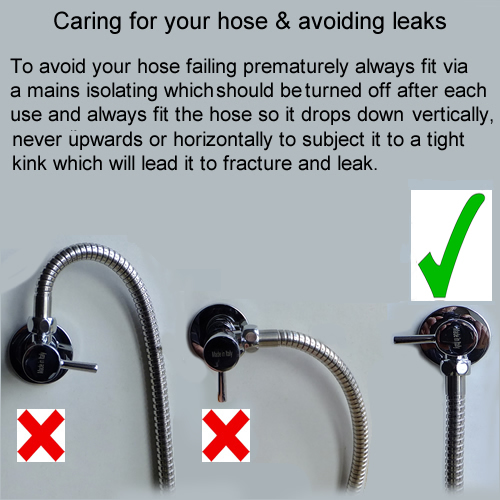 I ordered a replacement hose for my bidet shower.The helpful advice provided on this site made me aware that the original hose had almost certainly failed because the isolating valve had been installed facing upwards instead of down. I got round this by attaching a hook to the wall half-way between the valve and the spray head, so that the hose rises vertically from the valve to the hook, thus removing any sideways tension from the hose at the junction point with the valve. I ordered the product on a Saturday and it was with me by Monday, even though I had opted for free 2nd class postage. Excellent service and product. I have bought this product to replace the original hose which has stopped working after just under 3 years use. As I have three bidet showers in my house, I have bought three just in case. There was an initial hiccup where the nut was over tightened causing it to leak. However, after a phone call. the problem was sorted immediately. Its very easy to install and last long without leak. The product was fine. The previous inner hose had burst due to me not turning off the water supply after use. HOS-SS: 1.2M Double lock stainless steel hose with neoprene interior sheath. 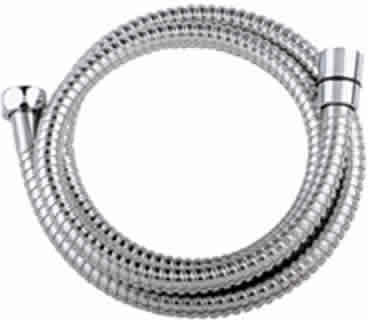 If this hose is to be used in a pressurised environment such as bidet shower please ensure it is connected via a mains rated water isolating valve which should be turned off after each use. 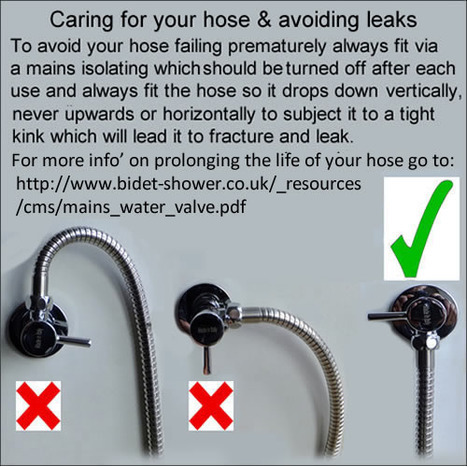 DO NOT rely on the hose to hold back mains water pressure continuously, if you experience a pressure surge this could BURST your hose, be safe connect via a mains water valve and always turn off the water to the hose after each use, to understand why click HERE When connecting hose, the conical end of the hose is connected to the shower head and the small nut to the water supply valve. Please click HERE for do's and don'ts when attaching your shower to the water outlet valve.